18th June 2015. That was the date that Surrey’s season reached a low. That evening, Surrey left the field at Guildford having been defeated by seven wickets by Glamorgan. This, after winning the toss, scoring 406 and having the Welsh county 106 for six in their first innings. They left that game 48 points adrift of leaders Lancashire at the halfway point of the County Championship. The T20 Blast campaign was in disastrous shape, the London county picking up four points from their first six games, and rooted to the bottom of the South Group. They had won four matches from their first 14. Things looked extremely bleak. After that Guildford defeat, however, things turned a corner. Surrey won four of their remaining eight Blast games as they staged a late, albeit unsuccessful, charge for a place in the knockout stages. It was a disappointing end to the campaign, particularly considering defeat to rivals Middlesex all but confirmed their exit. This was a blessing in disguise, however, as they were able to focus on the Championship and the Royal London One-Day Cup. Six wins from eight group stage games, including a no result, saw Surrey top Group A in the RLODC in relatively emphatic fashion – three of those victories were by at least 40 runs. Things became far more nerve-wracking after that, however, as knockout matches against Kent and Nottinghamshire almost ended in disaster thanks to centuries from Matt Coles and Greg Smith, who nearly clinched victory for their respective counties having stared defeat in the face. Playing Gloucestershire in the final, a Jade Dernbach six-wicket haul, including a hat-trick, and half-centuries from Kumar Sangakkara and Rory Burns left Surrey with one hand on the trophy. Some poor batting and relentless good bowling from Gloucestershire saw them lose by six runs, but it had been a strong campaign, especially after winning just one game in this competition in 2014. 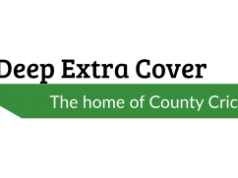 Before, and during, their success in the RLODC, Surrey needed to recover in the Championship. That’s exactly what they did, winning their next four games, including an innings victory over Gloucestershire. Still second, the gap on Lancashire had closed to just ten points with four games remaining. The antepenultimate match of the season saw them leapfrog Lancashire as a Gareth Batty hat-trick secured his side promotion. Surrey were left on the verge of the Division Two trophy – needing to avoid defeat to their contenders and pick up one win to guarantee the title. Despite their best efforts, they couldn’t quite beat Lancashire or Northamptonshire, but Lancashire’s draw at Essex saw Batty’s men lift the trophy. They had won 17 from 27 after the Glamorgan defeat, and it had been quite the turnaround as desperation turned to joy in an ultimately successful season. The focus this year has been on young players, and they’re certainly in good supply at The Oval. The two standout stars were Tom and Sam Curran, but Matt Dunn had a solid season in the Championship, picking up 28 wickets from his nine games, James Burke played a huge role in Surrey’s One-Day Cup campaign and another strong year for Zafar Ansari saw him called up to the England squad for the UAE. In addition, the experience of Kumar Sangakkara and captain Gareth Batty has been invaluable this year, both on and off the field. Contributions from everyone, however, was the key to Surrey’s success, and regardless of their age, it’s clear to see an abundance of talent at The Oval. 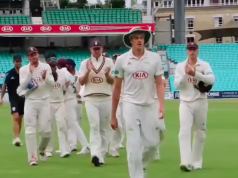 Some have made comparisons to Surrey’s almost identical 2011 season, where a mix of developing and experienced talent led them to promotion and a List A trophy. The death of Tom Maynard the following year was, understandably, a game-changer for that group of players, something that, one would hope, will not be an issue next year. They found form at the end of 2015, ending on a high, and with the developing players a year older, 2016 could be a really great year for Surrey. Tom Curran had quite the season. He took 105 wickets at 24.9 in all formats in 2015, including five-wicket hauls on five occasions along with a ten-for in the final Championship game of the season against Northants. His good form this year has also led to him being picked in the England performance squad. Tom Curran may have taken over 100 wickets across all formats this season, but it’s his younger brother Sam who has been making all the headlines. 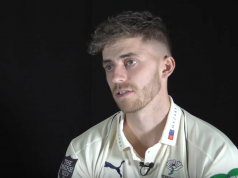 At 17, he has 44 wickets from 23 matches since his debut in June, and consistently bowls at 85 miles per hour, along with 239 first-class runs at 47.8 in six games, and is a future England star in the making. While it’s difficult to pick any player who notably struggled during the year, Gary Wilson might have been slightly disappointed with his season. Unable to make a competitive century for the first time in three years, he also struggled with the gloves in the Nottinghamshire RLODC semi-final, and lost them to Ben Foakes in the following game. On several occasions in the One-Day Cup, Surrey suffered a collapse caused by a top-heavy batting order. This was none more notable than in the final, where they lost their last eight wickets for just 71 runs and lost a game they had all but won. The middle order have batting talent – that’s clear to see – but the inability to put it into practice as wickets fall cost them. Defeat in the One-Day Cup final would have dampened the mood slightly at Surrey, but it’s been an otherwise impressive season that has seen young talent emerge and experienced players at the top of their game as silverware returned to The Oval.